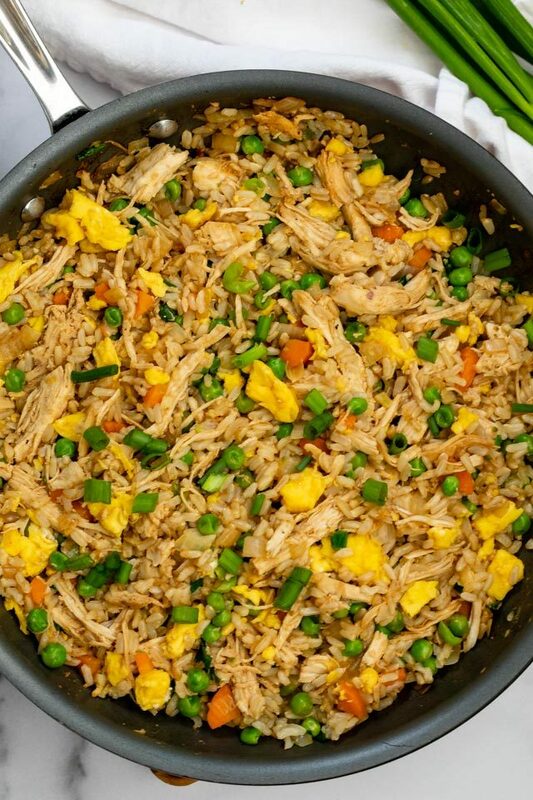 Easy Chicken Fried Rice – this 20 minute meal has 5 WW Freestyle Points and is great for dinner or lunch! Make this easy fried rice recipe once and eat it all week. I bet you’ve been wondering where I was going by posting just plain old shredded chicken and brown rice. If you figured I was going to make it into some meals you’d be right! First up, Chicken Fried Rice. 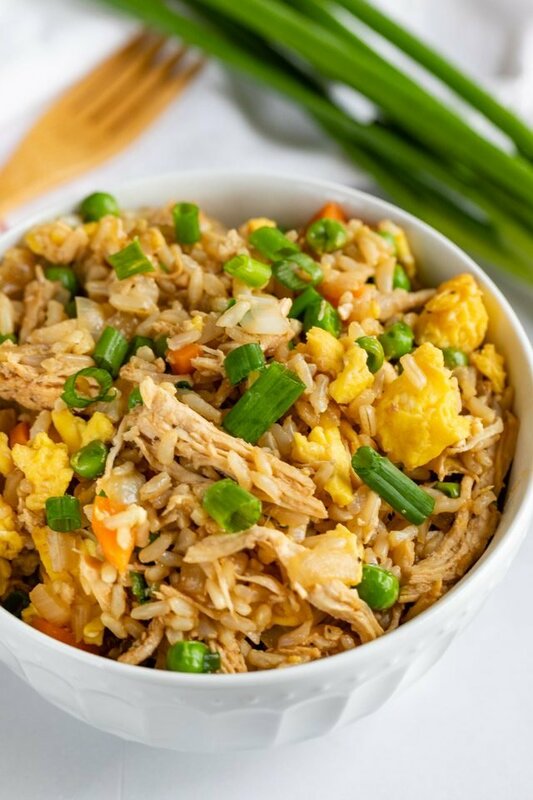 Not only is this Chicken Fried Rice an easy meal to make (it’s done in under 20 minutes) but it’s also a Weight Watchers recipe! It’s hearty enough to be a main dish for lunch or dinner or a side dish to your favorite orange chicken. If you’ve meal prepped your chicken and rice, or if you have leftovers, this 20 minute meal is the perfect one for busy nights or for meal prep. I ate it for lunch the day I made it and then ate it for two more lunches! 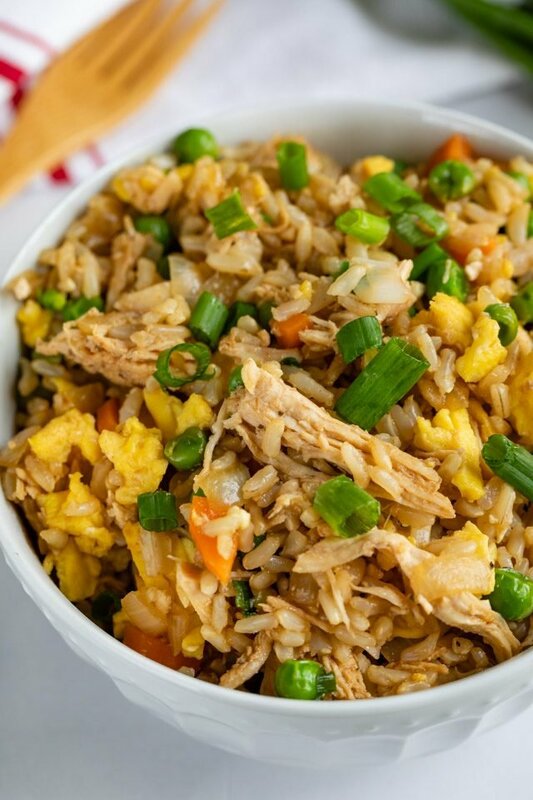 Easy Chicken Fried Rice is a simple 20-minute meal that’s Weight Watchers friendly with only 5 freestyle points per serving! I’m assuming that takeout fried rice isn’t very good for you. Even though it has a bunch of good-for-you ingredients, it’s often made with white rice and fried in a bunch of oil. This Chicken Fried Rice is a healthier copycat version. How is it healthier? I used minimal oil. Because the chicken was already cooked, all I needed was a bit of oil for the vegetables. I used brown rice instead of white. I love calculating WW points for recipes now that they are on the Freestyle program. Vegetables, chicken, and eggs are all FREE, which means the points tally for this recipe mainly comes from the rice. First, make sure you have your cooked chicken and rice ready. I love making my instant pot shredded chicken and instant pot brown rice for this recipe. You can also use rotisserie chicken for this or cubed leftover chicken. You can make this from raw, but you’ll have to cook the chicken first, making the cook time longer. Don’t have rice ready to go? Whip up some minute rice or one of those pouches of rice you microwave. I used two whole scrambled eggs for my fried rice, but you can substitute 3 egg whites if you prefer. You scramble the eggs in the pan you make the fried rice in, so there’s no extra mess! At the end of frying, when everything is hot, you add some soy sauce. This gives the telltale fried rice flavor. Chicken Fried Rice is such an easy recipe to make for lunch or dinner! This recipe will make about 3 large main-dish servings that are 5 WW Freestyle Points each. Have a larger family? Double the batch! If you’re using the fried rice as a side dish, it will make about 6 servings that are 3 WW Freestyle Points each. What goes with fried rice for dinner? 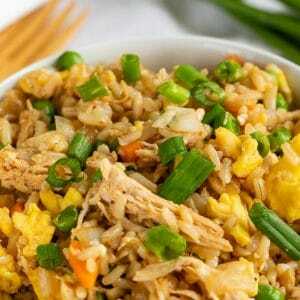 Easy Chicken Fried Rice done in 20 minutes and it only has 5 WW Freestyle points per serving! Whisk eggs in a bowl to scramble. Add to nonstick skillet and cook over medium-low heat, scrambling, until cooked through. Remove eggs to a plate and set aside. Wipe out pan as needed. Add oil, yellow onion and carrots and place over medium heat. Cook for 3 minutes, stirring often. Add the garlic and cook one minute more. Add the peas and cook 3 minutes more. Add green onions and chicken, cook for 2 minutes. Stir in the rice and cook until all is hot, then stir in the soy sauce. Cook 2 minutes to coat, then stir in eggs. Once the rice is all hot, it’s done. Serve as a side dish or as a main dish or lunch. 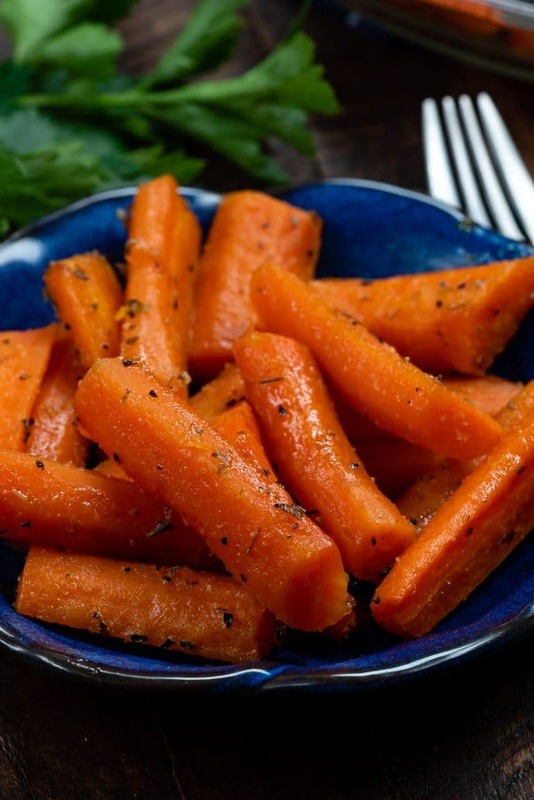 Make Easy Roasted Carrots as a vegetable side dish! 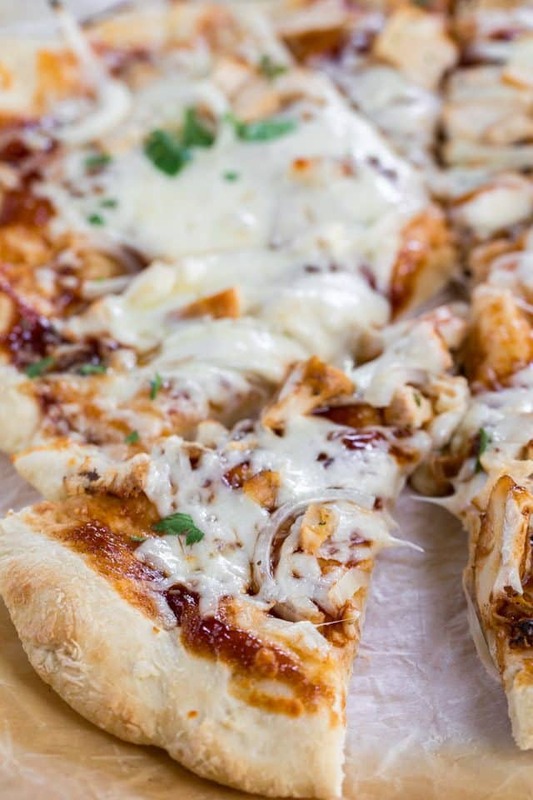 BBQ Chicken Pizza is another good way to use that chicken!